Mister Rogers' Neighborhood debuted nationally on February 19, 1968 -- approximately eight and a half years before I was born. I had graduated from college and completed a master's degree by the time the final Neighborhood visit initially aired in 2001. As we celebrate this 50th anniversary of the Neighborhood we've all come to love and appreciate so much, I ask you one question: "Why?" Why was Mister Rogers' Neighborhood so important? I'm not talking about nostalgia. I'm not talking about groundbreaking children's television. Why are you celebrating the Neighborhood? What's your story? Really. Look past the puppets and the cardigan. Past Mr. McFeely and the Neighborhood of Make-Believe. 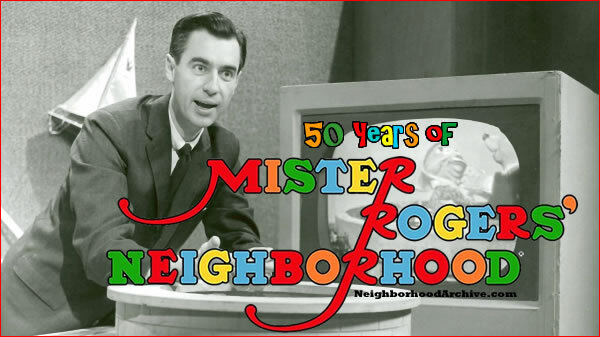 What is it about Mister Rogers' Neighborhood that has struck such a worldwide chord that we're celebrating the anniversary of a program that many have labeled for years as dated, soft, and boring? This is what we all long to hear regardless of our age, gender, ethnicity, background, or nationality. If you say you don't need to hear someone you love tell you that you are special -- that you are important -- consider me first in line to say you're fooling yourself. Everyone longs to feel valuable. Everyone longs to feel loved. Mister Rogers' message of peace, love, acceptance, and self-worth is one that is foreign to most -- an awkward topic that is not easily discussed. Society has conditioned us toward dissatisfaction with ourselves and a constant desire to fit the mold of expectation set before us. We should act a certain way. The pastor of my church recently delivered a message including a question that hit home as I think about the value Fred Rogers placed on self-worth: "When you look in the mirror, do you see the stuff you want to change, or do you see the beauty there to be celebrated?" As we celebrate fifty years of Mister Rogers' Neighborhood, I hope you are looking in the mirror, remembering Fred Rogers' message, and celebrating you. Thank you so much for all the work you do for Mister Rogers and his fans. I will be turning 50 later this year. Needless to say I watched plenty of Mister Rogers when I was a child. As a young adult I floundered around, lived with my parent and was still quite a sick kid. So... I continued to watch when I was laid up. 20 years ago I became a special education teacher. 5 years ago I moved to the Middle School level in my hometown and I work with students of varying degrees of intellectual disabilities and autism. Each day now, after our lunch we take a bit of a rest and recharge time, just 30 minutes. But that is long enough to get our daily episode of Mister Rogers in. It is probably one of the best parts of my day. There are so many teachable moments for my students. We pause the show, highlight something that was just said by Fred or on Make Believe. So thankful that his message is just as relevant now as it has ever been.